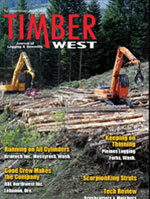 For fifty-five years, lumberjacks and jills have gathered in Hayward, Wisc., for the Lumberjack World Championships (LWC). Held in the latter half of July, the event draws competitors from around the world. Leaving their mark again this year were men and women from Oregon, Washington, and British Columbia. A happy Erin LaVoie is the 2014 Women’s All-Around Champion. The first Pacific Northwest female to win a championship was Tiffany Messmer (Seattle, Wash.), who ruled the Women’s Single Buck-Novice class and placed 3rd in the Women‘s Underhand-Novice. Michael Hattershide (Milwaukie, Ore.) stayed out of the water better than all the rest to win the Men’s Semi-Pro Log Rolling. 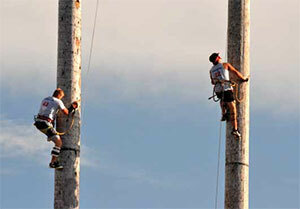 Hattershide also placed 6th in the 60’ Pole Climb, an event in which Brian Bartow (Mollala , Ore.) placed 2nd. In addition, Bartow won the 90’ poles and finished 8th in the Springboard finals. Caleb Graves (Bellingham, Wash.) ranked 6th in the Men’s Boom Run. Out of 46 competitors entered in the Axe Throw, David Moses, Jr. (Snoqualmie, Wash.) placed 8th. Moses was a busy man as he also took 8th in the Single Buck, 6th in the Underhand Chop, and 5th in the Standing Block Chop. Additionally, David did the standing block segment of the first-place relay team led by Amanda Beams (Australia), and he was one-half of the seventh-place Jack & Jill Crosscut team — which brings us to the “jill” on the other end of that saw: Erin LaVoie. Erin LaVoie, the 2014 All-Around Women’s World Champion, is a native of Spokane, Wash., who began competing in 2002. Over the years, she honed her skills, competing at various venues, but there is another reason for her success—away from the sawdust and chips. She has spent considerable hours training, building muscle tone, and increasing her stamina as a professional trainer. 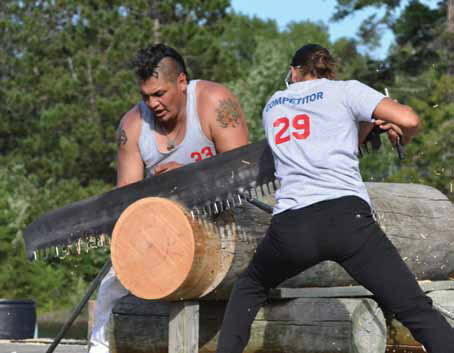 In the 2014 competition, there were four dominant lumberjills: Nancy Zalewski (Wisc.) — the favored champion, Erin LaVoie, Lindsay Daun (Ill.), and Denise Ott (Minn.). Sawdust and chips began flying on July 24 when they stepped up on the logs for the Underhand Chop. Erin finished 2nd with a time of 32.37 compared to Nancy‘s 53.28. After the first round of the first event, it was LaVoie - 5; Zalewski - 3. The race had begun. With David Moses, Jr., assisting, Erin LaVoie saws her way to the women’s single buck world championship. The women soon were on-deck again, this time with crosscuts in hand. Although each of the Mid-Western women had, over the years, won the Single Buck World Championship in Hayward, none came close to beating LaVoie, who led the way through the log in 15.00sec. After just two events, LaVoie had already built up a three-point lead over Zalewski, seven on Daun and eight over Ott. Those three competitors would soon regain lost ground. Everyone except Zalewski has a weak event. For LaVoie, it is the Jack & Jill Crosscut. Finishing only 6th, LaVoie’s point total was 12, allowing the others to quickly tighten the gap. Daun took 1st to pull within two points of the leader. Zalewski finished 5th and tied with Daun, while Ott took 3rd to more than double her points to a total of 7. On day two, with Ott eliminated from the Underhand on the previous day and this being Daun‘s weak event, it was left to Zalewski and LaVoi to pad their point totals. LaVoie’s second-place finish brought her all-around score to 17, while Zalewski’s third-place finish in the event moved her into 2nd place with a total of 14—four points more than Daun. 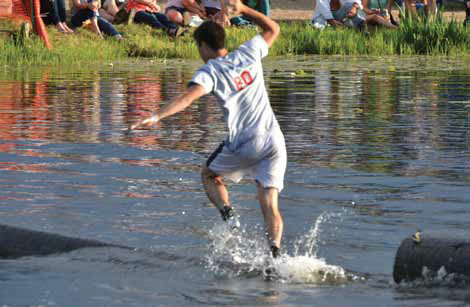 Caleb Graves of Bellingham, Wash., sprints across the boom logs and ranked 6th in the Men’s Boom Run. After the single buck, there was only one event left on Thursday. One event wouldn‘t be enough to overtake LaVoie, but the Jack & Jill was Erin‘s Achilles’ heel. How much of her lead would she lose? A multi-world champion in this event, Daun (with partner Dave Jewett (Pittsford, NY)), took 1st and gained six points. Ott and J.P. Mercier (Quebec) earned five points for 2nd place. LaVoie and David Moses, Jr. settled for 5th with two points, while Zalewski and Mike Sullivan (Winsted, CT) placed out of the top six. With sparkling performances, Daun came within five points of LaVoie’s lead (25 vs. 20), and Ott slipped ahead of Zalewski: 17 - 16. LaVoie‘s lead was solid but not insurmountable as she would only be in two events, having been eliminated from the Jack & Jill finals by 0.05sec. Zalewski‘s swings in the Underhand were swift, sure, and strong; the final blow coming at the 34.24sec mark. Still, LaVoie had subdued her 11“ aspen block nearly 4sec faster to secure First Place. 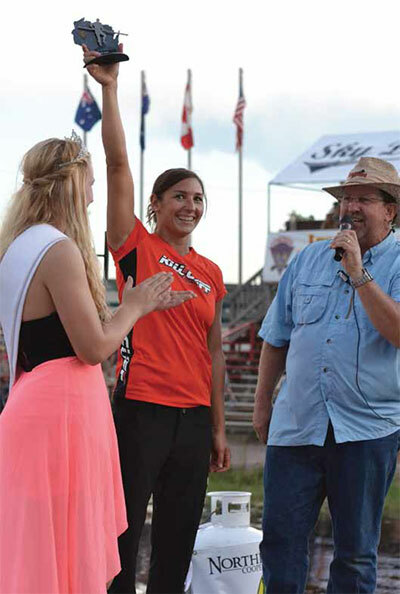 Instead of gaining points on the leader, Zalewski (current world record holder in the next event - Women’s Single Buck (11.61sec)) was now 11 points behind LaVoie and tied with Daun, the current holder (with Dave Jewett) of the Jack & Jill World Record (6.00sec). To win the All-Around title, either Daun or Zalewski would need to ace both remaining events and LaVoie would need to finish last in the Single Buck. On the left, Derek Knutson, climbs a half-step behind Lukas John-Brown (Squamish, B.C.). Lukas would go on to place 3rd in the Springboard finals. A champion has a champion‘s heart, and it showed in all four women. Ott took 4th in the Women’s Single Buck with a time of 16.61sec. Daun did a 16.13sec cut for 3rd while Zalewski zinged her way to a 16.04sec finish to claim 2nd. Unable to claim first place in the event, both Zalewski and Daun were eliminated from all-around title consideration—Erin’s lead was solid. During the three days of competition, none of LaVoie‘s all-around competitors had turned in a single-buck time under 16sec; in those same three days, LaVoie never registered a time over 16sec, having severed white pine cookies in 15.00sec, 15.64sec, and 15.03sec. That, my friends, is a championship performance. With Erin on the sidelines in the Jack & Jill Crosscut, Daun took first, Ott took third, and Zalewski followed in sixth place. Her lead unquestioned, Erin LaVoie claimed the All-Around Women‘s World Championship with a score of 37. Daun followed at 29, Zalewski at 26, and Ott tallied 24. Let me tell you, it was something to see.